To succeed in this world, you have to take chances. I believe that the finest films they’ve done today are done by original innovating filmmakers, who have the courage to take a chance and gamble. So I say to you: Keep gambling, keep-taking chances. 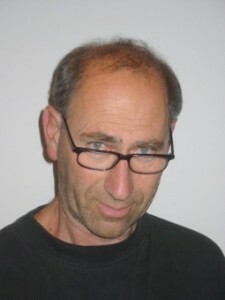 Gabriel Bornstein was born in Afula/Israel in 1948. He lives and works in Germany since 1983, studied film at the School of Art in Hamburg und lectured dramaturgy at various universities. In 2011 Gabriel Bornstein wrote his first novel with the same title ”45 Minutes to Ramallah”. (script wrieten together with Chalie Möller-Nass) The novel is to be published 2012. In 1999, Gabriel Bornstein and Klaus Weller estaublished the Full House Film Production. The idea was to produce independent films with very little budget. In December 2000, Bornstein made his debut film “December Kisses” with a budget of 30,000 DM, Bornstein’s own money. This is a story about a wounded runaway gangster who finds refuge in the bell tower of a church and is discovered by the priest’s daughter who falls in love with him. Bornstein wanted the plot to take place in a synagogue rather than a church, but the Rabbi thought the love scene with his daughter was not kosher; it also proved difficult to find a synagogue with a bell tower. In 2002, Gabriel Bornstein and Klaus Weller took a part in the film market at Cannes, where they’ve signed a contract with the American distribution company Lifesize Entertainment. The premier took place in December 2004 at the Abaton Cinema in Hamburg. The film was shown in several festivals and won a ”Silver Award” at the Houston Independent Film Festival.